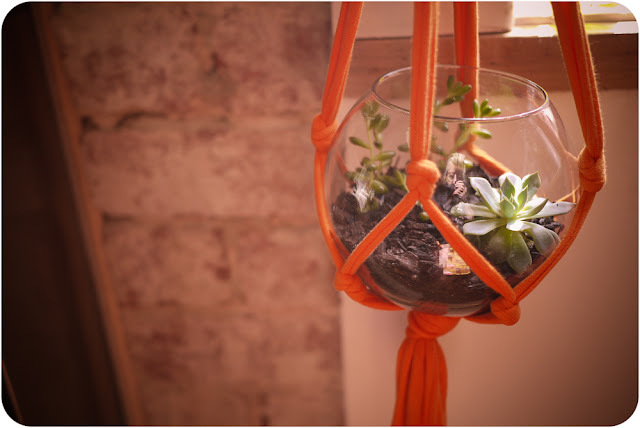 Have you, like me, noticed the love for macrame & terrariums online, in design blogs and pinterest faves? My friend at work talked about Terrariums a lot and we would laugh at the spelling and mispronounciations of the word... I could easily say 'terr-RAH-rium' instead of 'terr-rare-rium' to be posh. But I also remembered my family had a terrarium coffee table (YES!) 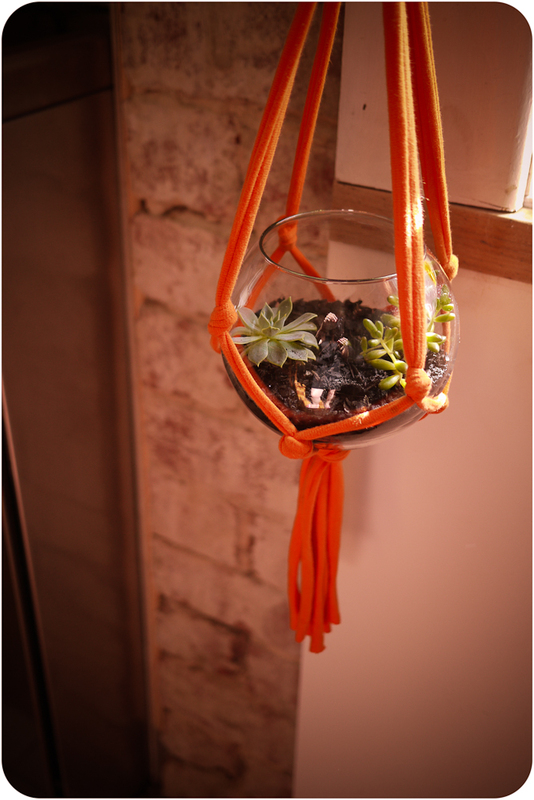 and although I don't we called it a terrarium, it was a magical place there indeed! Anyways, this week I cut up an old tshirt (bought especially for the colour from the op shop), and made this darling birthday present! 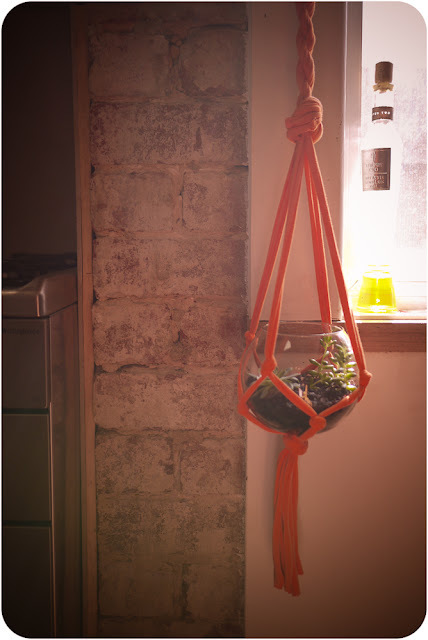 Following this tutorial was pretty easy for the macrame, you pretty much cut off a big tshirt under the arms, make it into 8 strips and then create a series of knots at different parts to cuddle the terrarium. 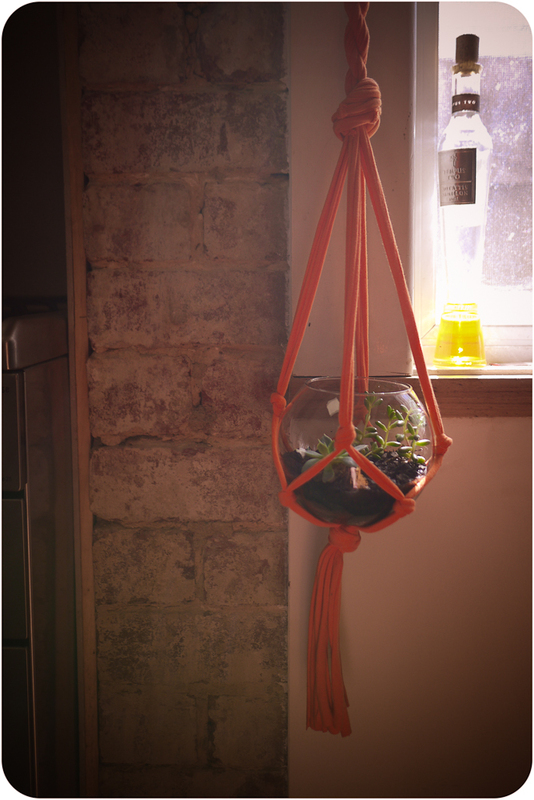 My test macrame was pretty neat, so it didn't take too long to get to making this orange one. I found the round glass vase at the op shop in Gippsland, and planted two little succulent plants a few weeks back to see how they'd grow. And they're just darling! If you're out walking a lot (like my #mamalyfe) you can keep your eyes peeled for broken bits of succulents if your neighbourhood grows them in the front yard. In the past few months, I've noticed lots of broken pieces or leaves and if you plant them, they'll grow! I never break off any bits, I just gather up pieces that I've found on the footpath, that's ok in my books! I absolutely love it, and might be a new favourite pass-time! Refashioning mens tshirts and growing succulents! 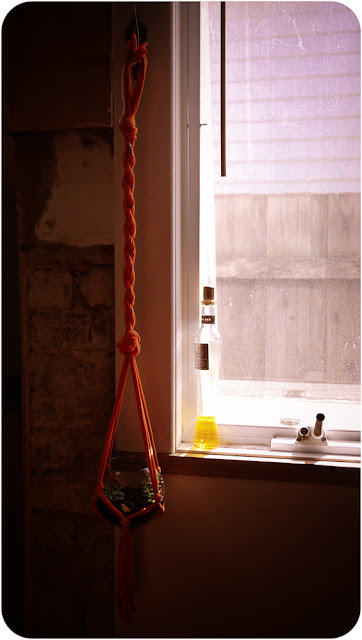 They would look great in the bathroom! What a great gift! Lovely!